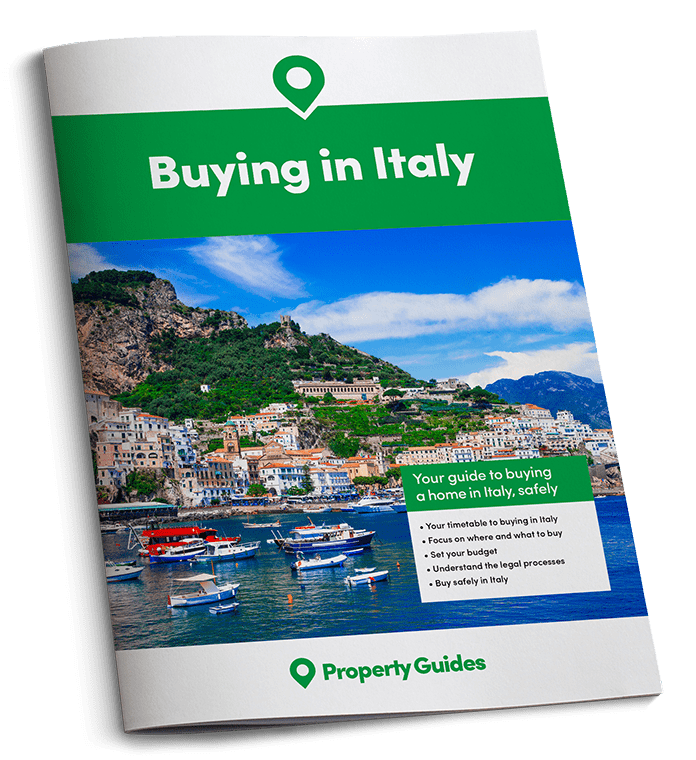 What can you expect to see during Holy Week and Easter in a typical Italian town? Easter Sunday is called Domenica di Pasqua in Italian, which this year is on the 16th April. On this day a statue of the risen Christ is carried through the town, families feast together and the children receive a chocolate egg. It is a happy family day, that follows the more solemn Holy week (Settimana Santa). To appreciate an Italian Easter you really need to also witness the atmosphere and traditions of the Holy Week that proceeds it. In fact, the procession which draws the biggest crowds is the “Processione dei Misteri” on Good Friday (Venerdì Santo). To appreciate an Italian Easter you really need to also witness the atmosphere and traditions of the Holy Week that proceeds it. 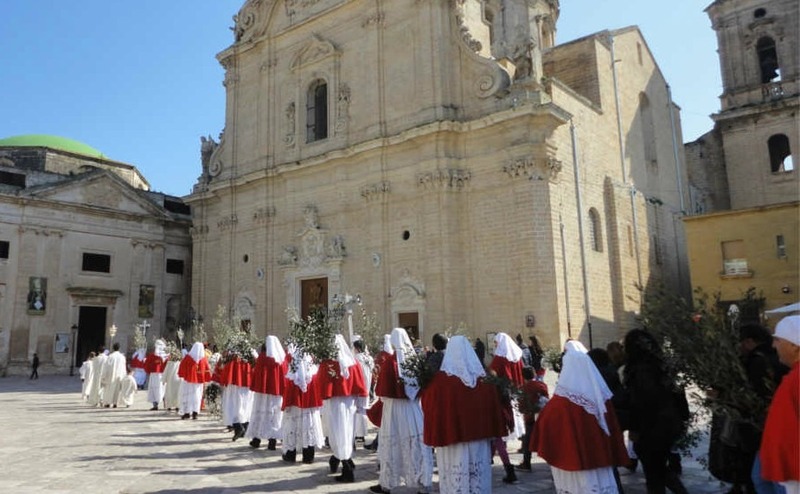 In my local town of Francavilla Fontana, in Puglia, the solemn Venerdi Santo procession is the biggest in the area, attracting thousands of people from miles around. Even if you are not religious, you can still appreciate the devotion of the local people and be carried along by the atmosphere the tradition creates. You also have the opportunity to admire the architecture of the churches, art and photographic exhibitions, and free music concerts. The town has its own brass band which accompanies the processions and a local folk group put on a concert of traditional music in one of the churches. The statues that are carried through the town are a work of art in themselves. They have been crafted by the “Cartapestaio”, and are made of papier-mâché. Another Puglian town famous for its Cartapestaio is Lecce, where you can buy smaller statues from the workshops. “La Confraternita di Maria Santissima del Carmine” go to the Mother Church in the morning to receive Easter. A long procession of brothers, with their heads and faces covered with white pointed hoods, make their way along the historic streets, a route walked by generations of their fathers before them. Along the way they sing an ancient song: “The sore sinner”. Palms and olive branches are carried into the church by the whole congregation, to be blessed. A blessing of the olive branches also takes place in the main street of Via Roma and the main Piazza. After the service the brothers, always masked, return to the Church of the Madonna del Carmine. This time, happy and serene, singing another song called “What a blessed day”. This is the first appearance of the Cross of the “Misteri”, bearing symbols of the Passion of Christ which opens all the Holy Week processions. 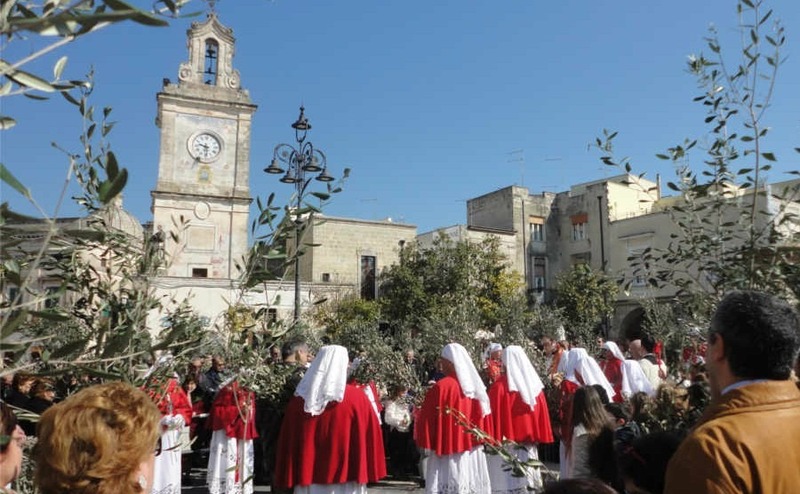 A moving theatrical presentation of the “Passione of Christ” takes place in the nearby town of Oria, where around 200 actors in costumes, including Roman soldiers, tell the story in an open-air performance. Over the past few weeks, children will have been growing grain on a plate or in a basket. They then decorate them with flowers and coloured eggs. On Wednesday morning, they proudly walk around the town with their creations, showing them off to family, friends and any passers-by who wish to admire them. They then go on display in local churches for the Easter period. It is an ancient tradition for children to make peace between neighbours, family and acquaintances in this way. It is an ancient tradition for children to make peace between neighbours, family and acquaintances in this way. The Congregation of the Church of Carmine enjoys centuries of privilege to perform the pilgrimage to the churches of Francavilla Fontana. The pilgrims wear finely embroidered white gowns, their faces covered by a white hood with only two small eye holes. Outside of the church they put on a Pilgrim hat and with rosary in hand go barefoot, two by two, from church to church. The tour is to a set route and at each church they remain on their knees, until the arrival of another pair of pilgrims making themselves known by beating a stick, with a small cross on the top. After greeting, the two pairs rise and the first pair come out and go to another church where they repeat the same ceremony. When passing through the main piazza the arrival of each pair is greeted by two trumpeters, playing a funeral dirge passed down for centuries. This ritual was handed down by the Carmelite Friars who, when they went to the Holy Land, accompanied the pilgrims to visit the places of the “Passion of Christ”. 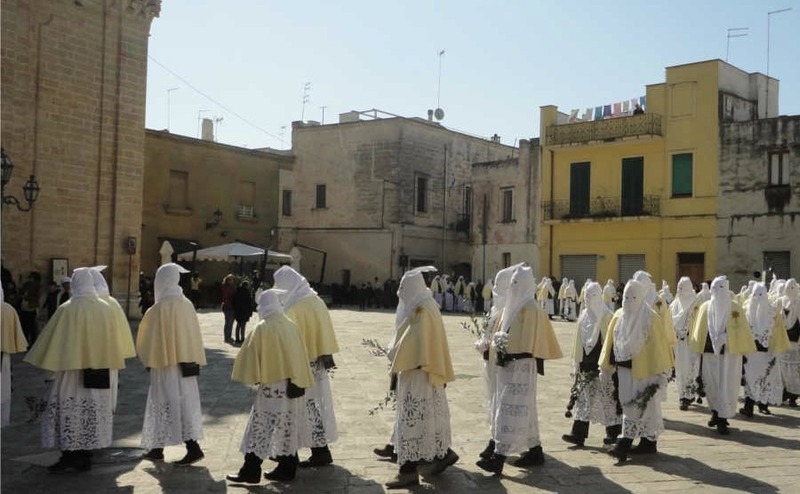 The integral part of Holy Week is the procession of “Misteri”, which is attended by thousands of people lining the streets. The Church of Santa Chiara and the large piazza of the Mother Church is filled with people anxiously awaiting the appearance of various statues of Christ, decorated with flowers. Each one is a brilliant piece of artwork representing the “Stations of the cross” depicting Jesus Christ on the day of the crucifixion. They are carried by the faithful and accompanied by sombre music played by the brass band. Following them are the cross-bearers “Pappamusci cu li trai”, bare-foot penitents dragging large heavy wooden crosses. There is an eerie silence amongst the crowd with just a clattering sound as the crosses are dragged across the ancient limestone paving. The procession of the risen Christ is accompanied by the more joyful music of the marching brass band and begins at the Church of “Immacolata”. A visit to the local bakery on a Sunday morning is a real treat, especially at Easter. They sell hundreds of small cakes and make the traditional Easter lambs, made totally of almond paste. More photos of Holy week and Easter in Francavilla Fontana can be found here.